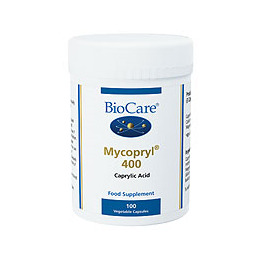 Mycopryl 400 combines caprylic acid, calcium and magnesium to provide a medium strength gastrointestinal formulation. Caprylic acid helps maintain balance of healthy intestinal microflora. Mycopryl 400 also provides a source of calcium and magnesium. Caprylic Acid, Capsule Shell (hypromellose), Calcium Hydroxid, Magnesium Hydroxide, Anti-caking Agent (Silicon Dioxide & Magnesium Stearate), Bulking Agent (Cellulose). Mycopryl 400 capsules should not be opened or chewed. This product should not be used as a substitute for a varied and balanced diet and healthy lifestyle. Do not exceed the recommended daily intake. Do not purchase if seal is broken. Keep out of reach of children. If you are under medical supervision, please consult a doctor before use. Not suitable for use during planned pregnancy, pregnancy or breastfeeding. Caution is advised for people with colitis, gastrits or ulcerative conditions of the stomach/intestine. 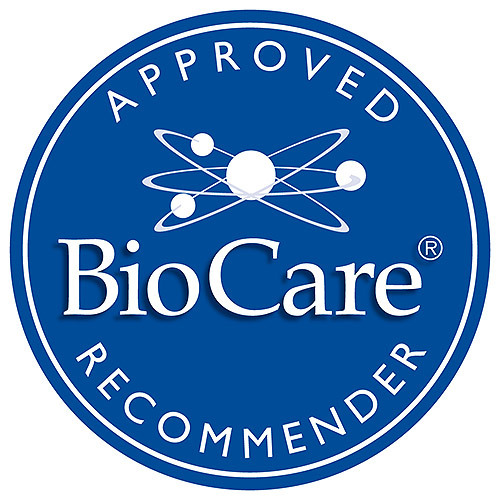 Below are reviews of Mycopryl 400 - Caprylic Acid- 100 x 400mg Vegicaps by bodykind customers. If you have tried this product we'd love to hear what you think so please leave a review. 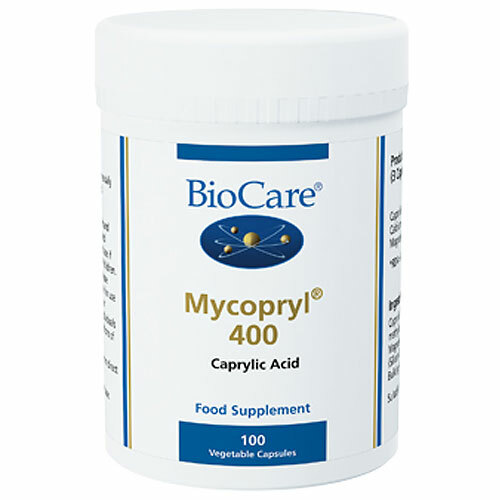 Mycopryl 400 combines caprylic acid, calcium and magnesium to provide a medium strength gastrointestinal formulation. Caprylic acid helps maintain balance of healthy intestinal microflora.